Two weeks ago, I was in a state of panic. I haven’t been back to my favorite surf spot somewhere in Dahican in almost two months. So I packed my stuff and took off with my surfboard in tow and the pasalubong I promised my local friends. It was a nostalgic ride since I took the bus this time. I haven’t been on a one in almost half a year. The thing about riding the bus to any point in Mindanao is that it takes almost two to three hours longer than riding a private vehicle because it stops at every terminal along the way. No luck when I arrived at the terminal as there weren’t any non-stop buses to Mati City on Sundays, I found out soon enough. The good thing traveling midday on Sundays is that the crowds and traffic is thin. The bus quickly filled up and soon we were on our way. It was a record time commuting for me that Sunday. We arrived in Dahican after just four hours of travel. The bus didn’t speed unusually too so we had enough time to fill our tummies before we traveled from the city to Dahican. I don’t think it’s just surfers that feel very outspoken about protecting what we love. I think it’s all of us humans. It’s natural to protect what we love. In this case, we love our playground - the ocean. Despite how unpredictable the ocean is, it’s the perfect playground for anybody who’s lured to the sea. It could how the sand feels to the soles of your feet or the way the warm tropical seawater relaxes your soul when you dive in. Whatever the reason we have for coming back to the ocean, we find a place of solace and a paradise to play in, the most natural way to connect with our environment. Think of it like your house or room. Don’t you adore the beauty of your space when it’s clean and tidy? The feeling of a fresh breeze entering and the way it just brings to life every sense in your body - this is how the ocean is to me. The only difference is that I can’t go around put a fence around the sea and call it mine. And I think here’s the problem. Unless we legally have rights to shoreline property, everything else is public property or the government’s. See how everything's beautiful when kept clean? Walking along the shore for the first time in months, it was a shocker for me to find my favorite beach in the world still littered with trash. I used to just ignore the trash I see within my line of vision and within my reach except if I’m in the water. If I see plastic floating I’d normally pick it up and find ways to keep the trash until I get out of the water. Lately, I’ve been pushed to the edge of disgust with just how uncontrollable people are with their trash, especially if left just by the shore. Throughout time, I’ve become aware that trash that doesn’t find its place in a proper storage (like a garbage can) eventually finds its way into our ocean and waterways. So the mentality of “out of sight, out of mind” doesn’t fare very well with rubbish. It’s being irresponsible of our waste. If we could only train ourselves to have the habit of throwing our trash where it belongs, we could greatly minimize the waste that’s found lying on our favorite beaches, streets and other places where humans frequent. I don’t think it’s a very nice thing to do throwing trash off our neighbor’s fence so they could deal with throwing it properly right? I don’t think it’s right to give others that responsibility and that should be the same etiquette when we’re outdoors. The incident that pushed me to take things into my own hands was when I was surfing with my local friends one day. Before we wouldn’t normally encounter a lot of plastic floating in the lineup when we were in the water but it’s getting scarcer seeing our spot plastic-free. I was paddling in to catch this decent-sized wave that was favoring my frontside. I love catching this type of wave since I could play around with it more than with my back facing the front of the wave. I was in the zone and paddling as hard as I could. I needed one last paddle and just as I placed my right arm in the water, I found myself entangled in what was a huge clear plastic I hadn’t seen earlier. I wanted to catch the wave so bad so I tried prying myself free by flailing my arms but to no avail. The wave passed me by. I lacked one more paddle and I was supposed to be riding that wave if I didn’t get caught in plastic. Feeling angry and helpless, I paddled back to where my friends were and demanded where the plastic was. Obviously, I wasn’t angry at them for not picking it up since nobody saw it but I was just so outraged that the plastic battle has finally caught up with us. Surfers, beachgoers or divers - I have a firsthand experience how plastic ruins fun. How much more does it ruin life when countless marine creatures battle with it every day? That must be how turtles feel when they get caught in plastic. You actually feel like drowning and yes, you really can suffocate. Good thing I was on top of my surfboard and not swimming when that happened. The natural connection being in the ocean is best shown through photos like this. The act seems so simple, in fact, it seems too simple and almost sheds shame on the person picking up trash. But we have to look beyond the act and realize that the most shameful thing is to pass up the opportunity to create impact and awareness. Even if you only picked up 10 pieces of trash when you walk on the beach weekend getaway, that’s an impact on a small scale. If you and your friends (let’s say five) pick up at least 10 pieces of trash, that’s easily 50 pieces of trash you just cleaned up off from the beach! Look at the scale if we all do our part, stop playing blind and expect someone else to do the picking for us. The more people who make an effort to pick up even as little as 10 pieces of trash at a given time, the more trash we keep out of our ocean. Another impact of picking up trash is basically seeing less litter on our shores, avoiding animals from ingesting it and making sure trash doesn’t end up in our oceans. Trash that’s not properly disposed of always finds its way to our oceans. We can’t keep doing this to our planet and destroying it for the next generations. It's a humbling task yet it only takes up a few minutes but creates a huge impact. Photo by Mark Bucong. It’s a lonely task, I’ll have to admit. I’ve endured countless of stares from beachgoers who don’t seem to understand what I’m doing walking around and picking up other people’s trash. I think I’ve just had it seeing trash, complaining about it and yet not doing much about. Then I realized that people may not really be that exposed or educated about litter. There are some local communities that may just be completely uninformed about litter but when they see visitors to their home picking up trash, this encourages them to be responsible about their waste disposal. Yesterday, I was walking back to Dahican Surf Resort after a fun but very tiring surf session up my favorite break which is almost an hour’s walk if you’re carrying a surfboard (and walking barefoot in the sand). I was with Joshua, a local kid, and Sophia, a German volunteer, who was vacationing at the moment. It was noontime and the sun was scorching. I shaded myself using the surfboard and proceeded the long walk back when I stopped and stooped down to pick up a plastic straw that was coughed up by the waves. Sophia and I were talking about how bad the demand of plastic is in the Philippines and the even bigger problem of not disposing of it properly. As we were discussing, we were picking up trash as we went along. Then she asked why it wasn't normal to randomly pick up trash like we were doing. I sadly couldn’t give her answer that moment. I too didn't pick up trash a few years ago though I didn't throw them by the sea. Still, it was no excuse. I thought about that moment again. I wonder. It could be because we aren’t informed enough, or don’t see too many people (especially leaders) who are leading by example. I’m sure this was a profound feeling seeing Sophia lugging her beach bag filled with plastic bottles and another plastic bag filled with all assortments of garbage you’d see on a Philippine beach - lost footwear, article of clothing, plastic straws, beer bottles, plastic bottles and junk food wrapper. My local crew, Boom, Jan-jan, Mark and Dan-dan enjoying a quick snack after cleaning up the place. (We disposed of our trash properly too. These aren't disposable cups, just in case you're wondering). Remember a few weeks ago when I got tangled up in a huge piece of colorless plastic while surfing? That was my tipping point. I didn’t keep complaining endlessly about what people are not doing so I did what was supposed to be done by anyone who cared, I cleaned up our sacred little surf spot right after surfing. I enjoined my little group of local kids to help me pick up trash and put it in the plastic bags that were scattered around the area. Honestly, it didn’t take long for four people to at least make the area visibly more pleasing. 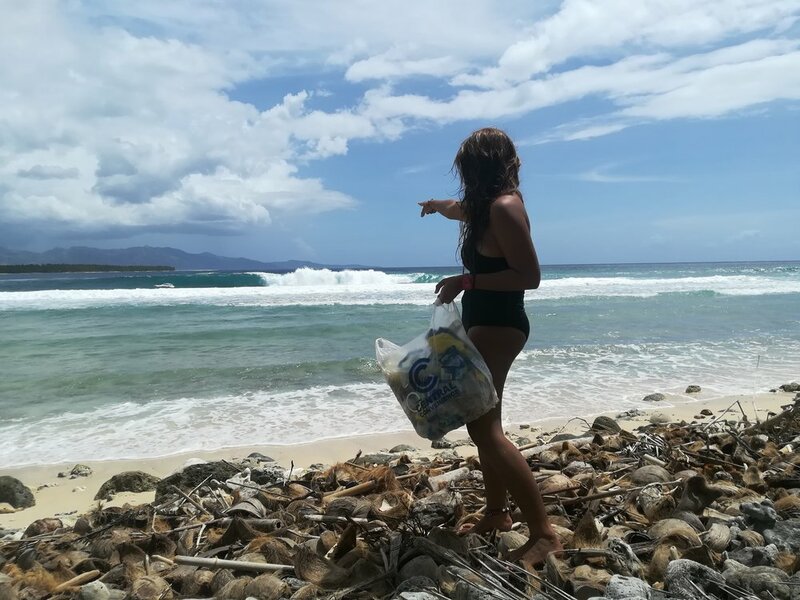 We pretty soon filled up two big plastic bags and couldn’t find any other means to contain the plastic that was stuck in the coconut and natural debris that was on the shoreline. Despite not cleaning it 100%, I felt accomplished and proud. It’s the feeling you get after a general cleaning of your room or house, it was perfect. The waves were also firing when we were doing our little beach clean up and I guess it was the ocean’s way of saying thanks. After collecting the garbage, I asked one of the local boys, Jan-jan, to please dispose of the garbage properly and not just throw it wherever. It’s useless to pick up trash when it’s not properly disposed of, we have to also be responsible in disposing of as well. The ocean's way of saying thanks and reminding us of her power. That was a huge wave that suddenly showed up while we were cleaning. Photo by Mark Bucong. I constantly remind the local kids when I have the time, to always pick up trash. Tell people (nicely) to do the same and continue creating awareness that if we don’t start, we’re going to have to suffer swimming and surfing with trash. I reminded them of surfing at Times Beach in Davao City (back to a time when the swell would actually make good waves). “Remember the itch I got for two days after surfing there for two hours? And do you remember the smell?” They nodded and agreed how the water didn’t even smell like water. We can’t wait for that to happen to our beautiful beaches that have lured both local and foreign visitors to our shores. Let’s do our part, pick up at least 10 pieces of trash when we see it lying around and turn this little habit into a collective movement worldwide. I hope our leaders see the value in this and create sustainable programs and regulations that ban single-use plastic (especially in the food and hospitality industry). There are a lot of alternatives to single-use plastic and FIlipinos have always been the creative and inventive mind, I’m sure there will be fun ways to lessen our dependence on plastic and at the same time, save up on costs like buying another plastic bottle of water when we’re vacationing. Returning two days later, the place still hasn't been littered and that's a good thing. Photo by @cheenchrisshei.